Turn the Tide on Plastics in the Ocean | Marine Life Society of South Australia Inc.
On Sunday 28th May, my wife and I attended a gathering at the Largs Bay jetty kiosk. 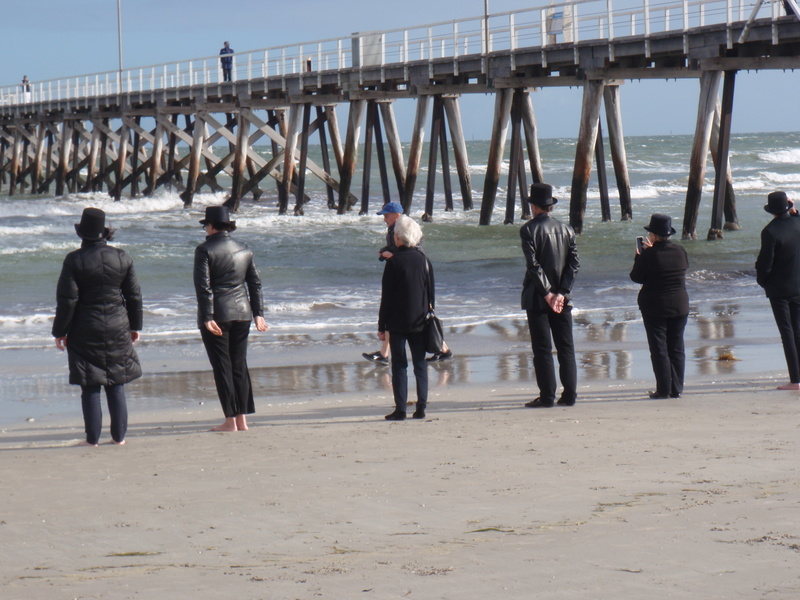 Artist Andrew Baines was conducting one of his famous photo shoots on the beach by the jetty. The photo shoot was being linked to World Ocean’s Day. It was held in collaboration with United Nations Associated of Australia (SA) & the City of Port Adelaide Enfield. 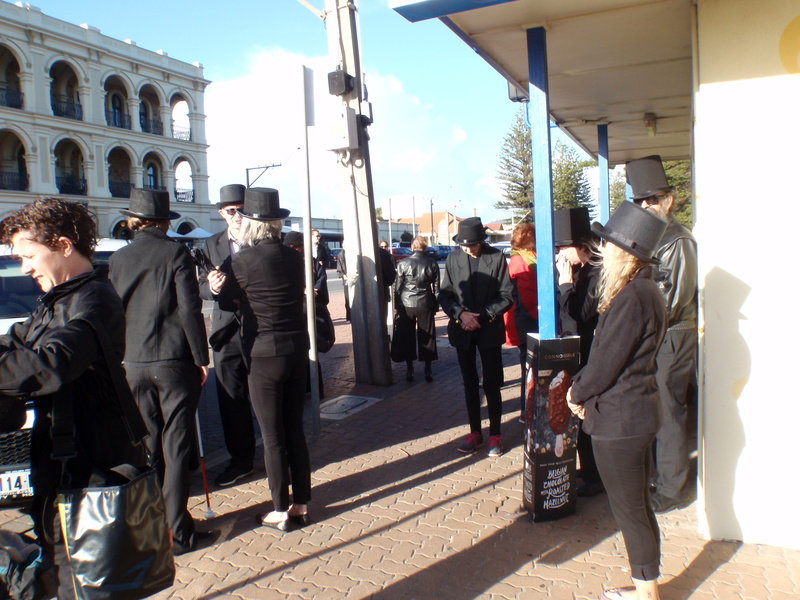 Everybody who wanted to take part in the photo shoot had to dress in black and wear a top hat. According to a Facebook post at https://www.facebook.com/CityOfPAE/photos/a.182419215489194.1073741828.104119179985865/370646783333102/?type=3&theater: – “The Lord Mayor and senior UN Officials joined our Mayor (for the City of Port Adelaide Enfield) and artist Andrew Baines on the Largs beach today to raise awareness against plastics poisoning our oceans. When Mayor Johanson wrapped up the presentations, I asked Mr Woodthorpe for the copy of his speech. Details are presented further below. Everyone then made their way down onto the beach in the cold, blustery conditions. Andrew Baines, and several others, took photos of the people as they trudged down on to the beach and eventually lined up along the water’s edge. Many hats were blown off of people’s heads and everyone was kept on their toes. Many of the participants took their shoes off of their feet so that they wouldn’t get them wet at the edge of the sea during the photo shoot. 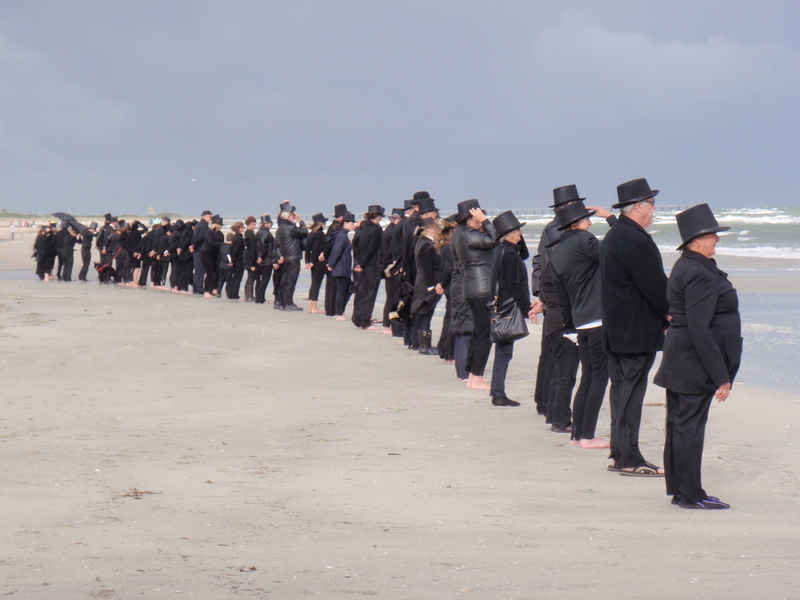 Noeleen was luckily wearing mostly all black clothing and she was included in the line-up along the water’s edge. Although I myself also had mostly black clothing on, I was wearing a navy blue jacket and I was told that I couldn’t be in the line-up. I happily stepped aside but, on reflection, I should’ve just offered to remove my jacket. Perhaps though, it was lucky that I didn’t try that in the sub-Antarctic conditions. 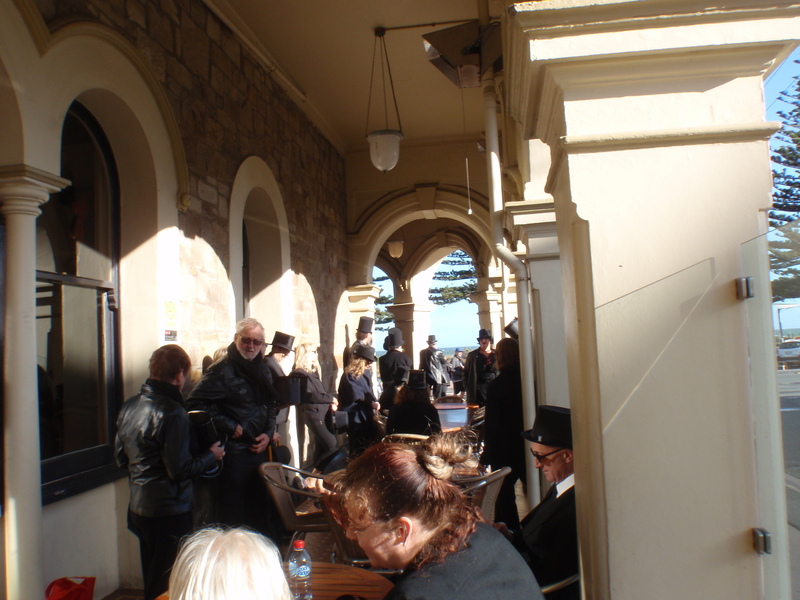 A Channel 7 film crew were there to film proceedings for the 6pm news. It took a good 15 minutes for all of the required photography and filming to be completed. There was then a rush back to the warmth of people’s cars and other warmer locations. An estimated 60 people were involved one way or another.